Perfluorooctanoic acid (PFOA) is a persistent organic pollutant, which may possess endocrine disrupting properties. Herein, we investigated the possible mechanism(s) of toxicity and steroidogenesis in mouse Leydig cells. MLTC-1 (mouse Leydig tumour cells) cells were exposed to 0, 50, 100 or 200 μM PFOA for 48 h to ascertain their effects on the nuclear (membrane) receptor responses, steroidogenesis pathway and related regulated gene expression and steroid hormone secretion profiles. Our results reveal that nuclear receptors PXR, SR-B1 and LHR are sensitive to PFOA exposure. PFOA can accumulate in mitochondria and alter cholesterol precursor (fatty acid) mitochondrial transport process-related gene expression and thus inhibit steroid hormone precursor (cholesterol) production. In particular, PFOA exhibits biphasic effects on testosterone and progesterone production at differing levels of exposure. These findings indicate the potential endocrine-related effects of PFOA on steroid hormone secretion in Leydig cells and point to a novel disruption model. 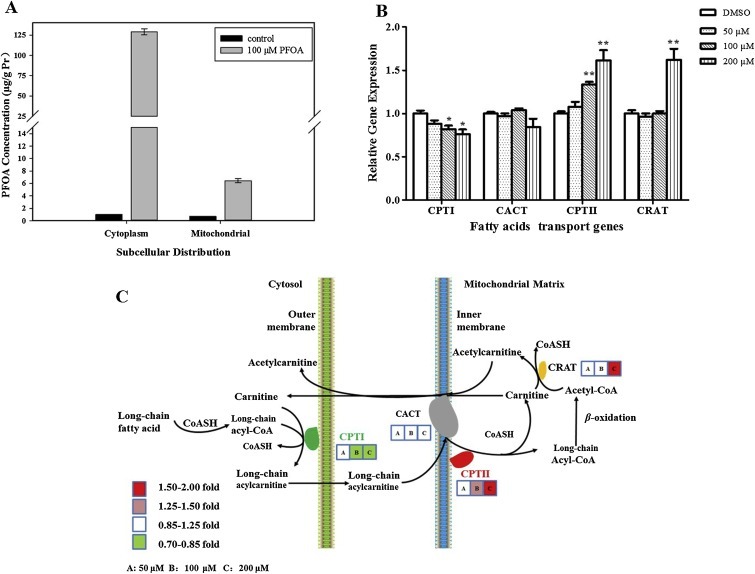 Effects of PFOA on the subcellular accumulation (A), fatty acids mitochondria transport genes expression (B) in MLTC-1 cells and schematic diagram of fatty acids mitochondrial transport (C).